Eastern New Mexico is a physiographic subregion within the U.S. state of New Mexico. The region is sometimes called the "High Plains," "Eastern Plains (of New Mexico)," or even "Little Texas". 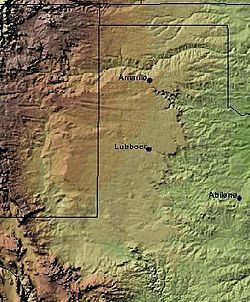 The region is largely coterminous with the portion of the Llano Estacado in New Mexico. Eastern New Mexico mostly lies upon the high plains, which extends to elevations over 4,000 ft (1,200 m). The region is mostly characterized by flat featureless terrain with the exception of the Pecos River valley and the abrupt breaks along the Mescalero Ridge and northern caprock escarpments of the Llano Estacado. The region typically lacks the high relief of central and northern New Mexico, such as that in the Sangre de Cristo and Sandia mountain ranges. Like much of the Llano Estacado region, Eastern New Mexico is largely agricultural and resembles West Texas in geography, culture, economy, and demographics. The region includes portions of the counties of Curry, De Baca, Guadalupe, Lea, Quay, and Roosevelt. It is served by Eastern New Mexico University, a state university located in Portales. West of Hobbs, Lea County, New Mexico. Gate leading to fenced pastureland in the wide open spaces south of Kenna, Roosevelt County, New Mexico. Abandoned post office in Bellview, Curry County, New Mexico. This page was last edited on 2 November 2018, at 06:05 (UTC).